Nelson Chamisa wants talks to be independently mediated by the SADC and guaranteed by the African Union and the UN. Zimbabwe’s main opposition leader snubbed an invitation by President Emmerson Mnangagwa to join a political summit today aimed at alleviating the country’s deepening crisis, weeks after security forces crushed protests over the worsening economy. Mnangagwa, who has faced international criticism for the brutal crackdown in January, invited leaders of the more than 20 political parties that participated in last year’s disputed polls to a “post-election dialogue” at his State House office. But the talks were held without opposition heavyweight Nelson Chamisa after he said he would only attend dialogue called by a neutral party. “It is imperative that we reach out to each other always and work out ways of resolving differences through peaceful means and dialogue,” he said in a speech at the opening of the talks that was open to the press. Police arrested more than 1,100 people, including leading trade unionists, lawmakers from Chamisa’s Movement for Democratic Change (MDC) and some children in the violent countrywide protests last month, which were sparked by a huge rise in fuel prices. Mnangagwa has said on Twitter that the invitation to the talks was “without preconditions, to begin a process of national dialogue”, urging “let us all put the people first and politics second”. 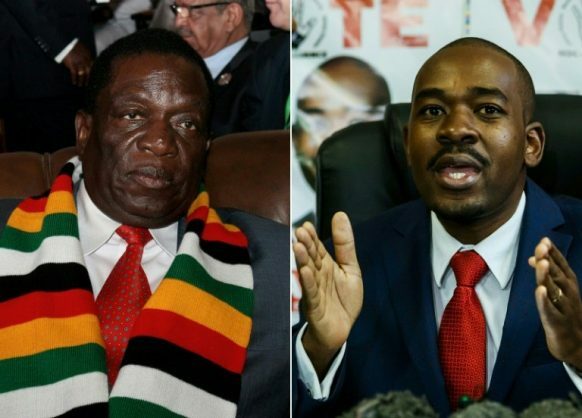 But Chamisa, who insists he won the July 30 vote, tweeted that the “presidency is disputed” because of “rigged presidential election result”. “We need genuine dialogue under a credible convener and mediator to solve this crisis,” he said. A dozen leaders of smaller parties did attend the meeting, including Thokozani Khupe, leader of a MDC breakaway faction, law professor Lovemore Madhuku and Nkosana Moyo, a former cabinet minister under Mugabe. Chamisa wants talks to be independently mediated by the regional organisation, Southern African Development Community (SADC) and guaranteed by the African Union and the UN. His spokesperson Nkululeko Sibanda said the meeting called by Mnangagwa was a ruse to divert attention from the protest abuses. Tens of thousands of people took part in the January protests after Mnangagwa more than doubled fuel prices, with the demonstrations descending into unrest as shops were looted and set on fire. A joint police and military crackdown, along with further security forces action since January, has left at least 17 civilians dead and hundreds injured, according to the Zimbabwe Human Rights NGO Forum. There have also been harrowing accusations of torture and sexual assault at the hands of the security services. Mnangagwa, who last week accused western countries of supporting the protests, has said the government “regrets” the loss of life, but has defended the crackdown in the face of the violence. He came to power last year pledging to revive Zimbabwe’s sickly finances and end its international isolation. The economy has been in a downward spiral for more than a decade, with cash shortages, high unemployment and recently a scarcity of staples such as bread and cooking oil.